In last few decades technology has evolved at a groundbreaking pace. We can keep in sync with this change in era only by studying and interacting with peers regularly. New software developed at a rapid rate have taken the market by storm as there is a multitude of options to select from. We are gradually beginning to outgrow the traditional methods and are drifting towards the technical aspects of business. But, as technology is revolutionizing the users have also become smarter. They enroll in training programs and get well-versed with the emerging trends. If they can’t take up sessions, the Customer 2.0 gathers information from Internet. This is a smarter way to learn by being self-reliant. Customer 2.0 has migrated to the more modern ways of implementation. The ability to adapt to these technologies is termed User Adoption. Powerful CRM systems as Microsoft Dynamics 365 require user adoption to augment the entire business process. It helps improve the Sales force automation, Customer Excellence, Vocational Experience and Data Management. We realized this intricacy and to bridge the gap came up with User Adoption Monitor. UAM is an easy to use simple but, powerful tool designed to empower the managers to track and monitor the activities of user within Dynamics CRM. It allows tracking user access both On-Premise and Online. Using user adoption monitor manager can gain a close insight into user activity and make strong business decisions. Native integration of UAM within Dynamics 365 allows monitoring and tracking of users to be done by being device independent. Users can access Dynamics CRM flexibly and adapt to the changes in the system from anywhere instead of waiting for a platform. As in most Online tools, UAM also has no hardware installation required to keep the system updated and maintained, thus saving infrastructure costs. Dynamics CRM dashboards enable monitoring sales, viewing overall business opportunities, business processes, and performance. Using UAM there are two ways to configure dashboards, Entity/Action/Period and User/Period. This gives the manager a compelling visual insight into user activity thereby enabling him to assign tasks to them based entirely on competency. Everyone doesn’t fit the same shoe and so do the users of an organization. 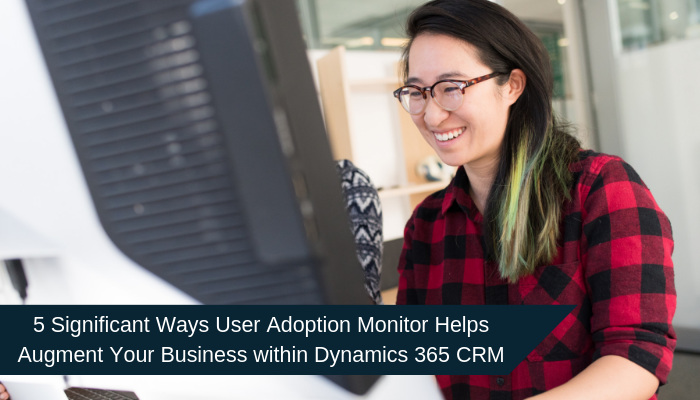 User Adoption Monitor ensures that every user within Dynamics 365 is assigned task based on their performance by tracking their activity and timestamp. As this is a fact that howsoever tech savvy one may be it is daunting to learn new technologies within a snap. User Adoption needs time and training which we are going to cover in our next point. Microsoft Dynamics 365 is a system that requires early adoption by its users. Without understanding of the aspects of CRM, the users cannot perform to their utmost capacity. UAM helps the managers to track the performance of users and design a training program accordingly. Training can augment the communication between Sales and Marketing team in alignment with their goals. As the learning curve of users improves, so does the user adoption, and thus performance which ultimately helps in building business. With a CRM system as Microsoft Dynamics 365 there is constant evolution in its UI. This means their needs to be great adaptability in its users to adapt to the rapid changes. The managers can track this change in trend and suggests measures for early user adoption thereby preventing any loss of business. Thus, we have seen how User Adoption helps in building your business by being proactive. If there is apt adoption to Dynamics 365 it turns out to be a tool of utmost potential thus leveraging your business’s ROI. Our solution User Adoption Monitor will help you achieve this goal with full potency. Download it from the website or from Microsoft AppSource. Keep writing to us with your suggested list of features you would like us to incorporate in our solution and our diligent team of Solution Architects will for sure work on it.